The Pilates method of exercise offers a total body workout enhancing the quality of life through improving strength, flexibility, control, coordination, body awareness and stamina. Pilates is an exercise system evolved for strengthening your core muscles. Every move we make in our daily lives is supported by the core muscles of the abdomen, back and pelvis. It is the strength of these muscles that will transform the way you stand, sit, walk, lift and breathe every day. Practicing Pilates will put you in control of your fitness and condition you for living your life on your terms; empowering you to build strength without bulk. You will see an increase in flexibility, improved posture, prevention or recovery from injury, reduction in back pain, improved performance in all sports activities, flatter and stronger abdominals and improved balance. Clients quickly find the benefits of proper movement patterns as they carry themselves into everyday life with the simplest task of lifting packages, children or anything, climbing flights of stairs, and navigating a walk down an icy roadway. 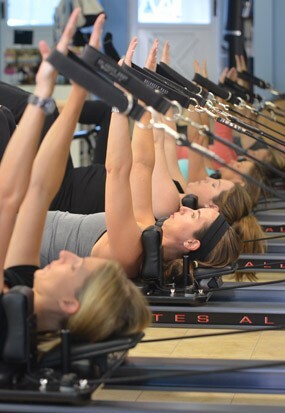 The benefits of a regular Pilates schedule are endless and life changing.